Our trip to the United States was a GIFT to Felipe and I. We are so thankful we had the opportunity to spend time with my family, dear friends, and meet new people and make new friendships. It was a short, busy and fast 6 weeks, but so rewarding. Our time in the US was truly a time of being in relationship with so many. I am so thankful for all the people with whom we were able to spend time with, and who blessed us in so many ways... even if it was just a short visit. Here are just a few photos of the many memories we made in the US with the many special people in our life. This is my sweet Grandma Bookout and I am very close to her. She is going to be 94 years old next month. Just to be able to see her and spend time with her was so important to me. I am thankful that my grandmother was able to finally meet Felipe. This was a strong desire in my heart that they would be able to meet and I am happy that it came to pass! The only time I cried when saying my goodbyes was when I told my grandma goodbye because I know it could be the last time I see her on this earth. Seeing her was truly a BIG GIFT to me from the Lord. Celebrating Christmas with my family was also a special treat. In Brazil, Christmas is not celebrated on such a grand level so it was wonderful to celebrate this holiday with my family and with the many fun American traditions. During our entire visit my dad and Felipe had a great time hanging out together, talking and enjoying each other's company. Here they are sporting their identical Christmas gift from my sister Elizabeth -- T-shirts from Charleston, SC! We spent lots of time with my parents! They were esspecially a blessing to us during our last week in the country. I was feeling terrible and unable to do much (due to some health problems I am experiencing with my pregnancy) and my parents were both extremely helpful to us as Felipe was trying to prepare everything to come back to Brazil. Thanks mom and dad! and their twin boys, Ben and Will. One day we even got to visit the boys at school for a special lunch. They loved spending time with Uncle Felipe - esspecially playing outside! I enjoyed reading with my nephews! I love reading with children and it was fun to read picture books at bedtime during the week we stayed at Becky and Shawn's house. I was happy to be in the US during January because we were able to celebrate two birthdays in my family. At my sister's birthday party (beautifully decorated by Felipe, my nephews, and me), I was not feeling too great but happy to be present there! I was so blessed to be able to spend precious time with several of my BEST friends on this earth, that I miss so dearly... and reconnect with many other friends and important people in my life. God has really blessed me with so many faithful and loving friends in the US and during this trip I was overwhelmed continually with the generous LOVE of God that was flowing through my friends. These two girls, Jessica and Sara, have been what you might call my lifetime best friends. We have been friends since the 4th grade, when I moved to the Raleigh area! It was wonderful to spend time with them! The first week in January, Felipe and I stayed at my best friend Amy's house. Amy and her husband Tom just had a baby girl in October named Lydia. She is absolutely beautiful by the way! We had the great honor of getting to be with this 3 month old baby girl and learn a bit from Tom and Amy about what life will be like for us as parents here in a few months. We also had some fun times together going out! We ate North Carolina Barbeque at Holy Smokes, in Garner! Great food! And Amy and Tom took us out to have Felipe's first Krispy Kreme Doughnut experience! A photo of me and some of my girlfriends at get together in honor of me being in town. We had a great girl's night of talking, eating and catching up with each other. I love these girls! My SWIFT CREEK ELEMENTARY SCHOOL Family! This was a great reunion! A bunch of my teacher friends (and even a former student and his mom) came to a special gathering for Felipe and I. These dear friends and co-workers were a HUGE part of my life as I worked full-time and substitute taught at Swift Creek Elementary during a span of 5 years. These women have invested in me, and have impacted and inspired my life in so many ways. God used many of them to encourage me as I stepped away from teaching and turned to pursue this dream of becoming a missonary and working with children in a different capacity. These teachers have taught me MUCH and I love them and was SO happy to see them while in Raleigh! Felipe and I enjoyed a get together with with some of my Brazilian friends in the US. It was great to speak some Portuguese and eat Brazilian food. 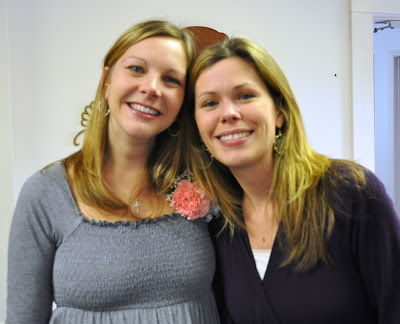 My dear friend Keila (who is to the right of me) is just 5 days less pregnant than me and she is also having a girl! During our visit we were able to share and spend time with people from various churches and we so enjoyed those moments of fellowship. We esspecially enjoyed speaking to small groups of people because it allowed for more interaction and questions. Next time we visit we hope to be able to visit more small groups and Bible studies to share about the work we are doing here in Brazil. I was so excited to be at my home church, Covenant Church International, in Raleigh, NC. It is an amazing church with a heart to LOVE the Lord and make Him known on the earth! I was so happy to introduce Felipe to everyone and share a bit of our lives with our church family there. I also got to help out a bit with some of the worship times at Covenant and felt so fulfilled and encouraged singing with the amazing worship band. Sweet times of worship and communion with God are truly refreshing! My best friend Jessica along with the ladies ministry of my church had the idea to throw a baby shower for me while in the US. On this day I was SO showered with love, thoughtful notes of encouragement, and extremely useful gifts! It is difficult to find good quality baby stuff in Brazil at good prices so this shower was a big blessing to us as a family in preparation for our coming baby girl. I loved the cake at the baby shower! Our daughter will be named Sophia Grace, which means wisdom and grace. When I saw this cake I was moved to tears, just at the sight of her name! 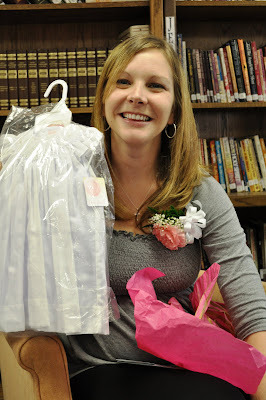 I received lots of cute baby clothes at the shower! Sophia has pretty clothes already! I want to say a BIG THANK YOU to everyone who came out to the shower and also to all those who organized and attended gatherings and special things in our honor. Also, thank you to everyone who gave or sent us baby gfts, offerings and warm wishes during our time in the US. We greatly appreciate your support and generosity! We were truly overwhelmed at God's provision and blessing. Thank you for investing in us as missionaries in Brazil and as a growing family! We are so thankful for all the memories we made together as a couple during our 2009-2010 trip! 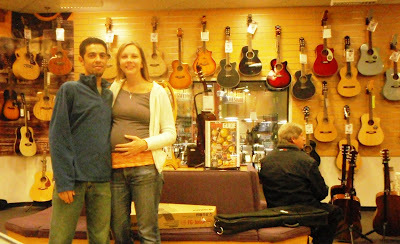 We made new memories doing the simpliest things such as going to fun shops (like Guitar Center), experiencing snow in Asheville, NC to seeing the sites in historic Charleston, SC. Hopefully in about 2 years we will return as a family with Sophia and we are looking forward to making many more special memories with many of you in the US!